Do you like rocks? Most people don’t realize just how creative you can get with a simple rock. Painting rocks and stones can truly turn them into a real work of art. Big rocks can be door stoppers or grace your garden. Tiny rocks can become kitchen magnets. Rocks that are “in between” sizes can be just about anything – from paperweights for your desk, to markers in your herb or flower garden. What’s truly wonderful is that you can paint them, making these rocks unique and special. Try painting rocks to look like favorite flowers, ladybugs, cute insects or hummingbirds. Or delicate patterns such as henna or mandala which are relaxing to look at. Another great idea is to add a word or saying to your favorite rock. You could put a piece of Scripture or an inspirational saying, keep the rock in your pocket so it is always with you. If you are a pet lover, try painting a rock that looks just like Fido or Fluffy when they are curled up, ready to take a cozy nap! One of the best things about rocks is that they are found in nature, so for most of us rocks are free and easy to find. If you are a crafter or DIY-er then you know what a great gift this is. You can make your handpainted rocks perfect for the outdoors by adding some waterproof, clear sealant after you have handpainted them, so they’ll always stay shiny and fresh, just like you’ve recently painted them. Happy Rock Painting! Here is a fun painted rock you can make with kids. What’s more adorable than a cute ladybug? Make smiling cat faces on rocks. Perfect for a “cat person” in your life. A charming dragonfly and a lush leaf, all on a rock. Perfect for your garden bed or a desk to remember spring days. 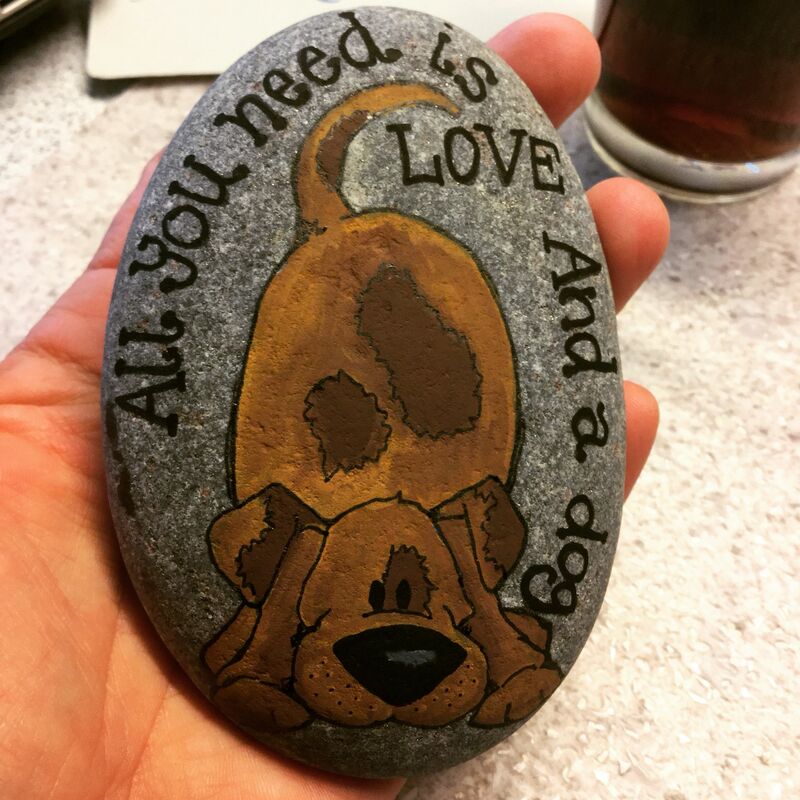 Here is a sweet rock, perfect for any dog owner. Look at the friendly dog on the rock! Have you always loved these? Follow these tips and you’ll soon be making your own! Now this is another great reason to paint rocks – to personalize your own zen garden. Great for meditation and relaxation. One great thing to do with a rock or stone is to write an affirmation on it. You can hold it and think positive thoughts each day. Did you know you can depict a whole landscape on a rock? Look at this beautiful sunset. Quick, put this fish in the tank! No, its actually a rock, but isn’t it lifelike? Doesn’t this look peaceful and serene? Its perfect for a gift or to put on your desk. Stones and rocks can be touchpoints for you. Add inspirational sayings and they can motivate you each day! Boho style art is very popular. Try creating a handpainted rock this way. A beautiful sunflower and a lovely mandala style rock. Rocks and stones can be stunning artwork. Isn’t this stunning? With simple dots, the artist has created a work of art on this stone. Look at this charming cat on a rock. Isn’t it sweet how the cat is all curled up? On a rock you can create a beautiful nautical scene. This makes a great souviner too! Here is a super cute rock that is a mouse. Why, its like having a rock that is a pet! On a rock you can paint words of inspiration. A simple stone can motivate you each day to greatness. Here is an adorable squirrel painted on a rock. It looks so lifelike! Fill your heart with peace and keep a bit of Scripture always on hand. With a rock like this, you’ll always feel steady and calm. Now this rock is just decorated with tiny dots. But look at how stunning it is! Aren’t these cute? Perfect for a child’s room or your garden bed. Here is a rock that can help you find peace. A rock to sit with in quiet moments. These rocks are created in nearly art deco style. Look at the lovely hummingbird too! Bzz! Don’t swat that bee! Just admire this handpainted rock! Always know what herbs or flowers are growing in your garden. These charming rocks mark your garden so easily. This is probably one of the cutest rock art collections we’ve seen so far. 4 rocks, painted like different types of cacti! Here is a charming rock to mark your herb garden. A set of these will make gardening a lot easier! A simple rock with some thought can actually become a stunning work of art. Look at this lovely mandala style rock! Look at this sweet doggie rock! Its perfect to give to any dog lover you know. When painting rocks, remember to use all of the space on a rock for a beautiful design. Look at this lovely butterfly. Some painted rocks do more than look great, they can help your children learn. Take a look at these Story Rocks, inspired by Montessori and Waldorf schools for children. Bright and colorful, these are lovely stones. Look at the beautiful mandala patterns. Here is a bright, modern art style rock. Depicting a tree it is perfect for your garden bed or desk. Like Henna patterns? Look at how elegant they look on simple rocks! Look at these beautiful feathers. So delicate and perfect for long, flat rocks too. One great thing about painting on rocks is you can add inspirational sayings. This is a rock that will make anyone smile! Love flowers? These look as if you could pick them right off the rock, so realistic! These feathers look so delicate and feminine. A bright touch to your garden!